However, the data is far from complete. This shows the range of all the stations in Southern Ontario. You can see that the bulk of the data is clustered around just a few years. One station with the longest range of data is Belleville, however it ends in 2006. 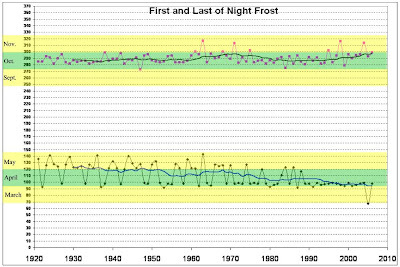 Here is the start and stop of winter as definted by the last night frost in spring and the first night front in the fall, thus the growing season. This plot shows the number of days above 30C (which is the points that are past the upper second standard deviation). This is the number of days below -20C. This is the number of days below zero. The big change in the early 1930's is due to incomplete data in 1931 and 1932. It is clear that the hot days in the summer are dropping, while the coldest temps are warming. Thus the temps are narrowing in their range since the 1940's. Thus this begs an interesting question. If the summer temps are cooling and the winter temps are warming, when will they converge and at what temp? It's some 750 years at 13C. Thus after that time, if these trends continue, the winters would be warmer than the summer! Obviously this cannot happen. Thus the current trends must change direction at some point in the future. Notice that the trend for the average crosses the trend for the max temps. It is mathematically impossible for an average to be bigger than the highest numbers that gave the average. Thus, this is firm evidence that the current trends are part of a cycle, a very small portion of a natural cycle and cannot in any way indicate that CO2 is warming the planet.